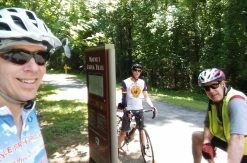 The Wendell Falls bike and hike trails are one of the ten trail systems in Oak City Cycling Project‘s Tetractus MTB Challenge. Finding these trails was a challenge for me. Maybe that’s appropriate for trails that are part of an ‘MTB challenge’. The guidebook author in me wants to change that. If you prefer to experience this challenge yourself, stop reading now! Even though TORC was involved with building the first of these trails a couple years ago, the first time I recall reading anything about them was in the Tetractus Challenge blog post. That post led me to the Newland Communities website for Wendell Falls. 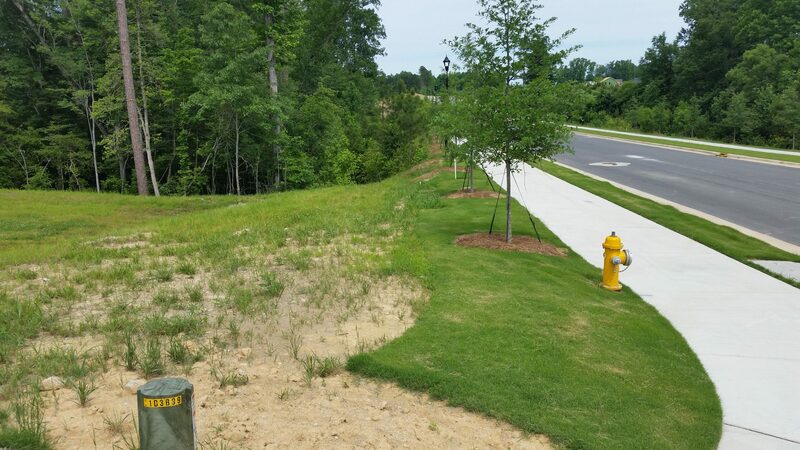 Newland is also the company behind the Briar Chapel community and their set of bike trails (also part of the Tetractus challenge). A nice video on the Wendell Falls website teased me with action shots of riders enjoying the Wendell Falls trails but didn’t tell me where the trailhead was. I went to MTBProject.com next for help. There were no listings for trails near Wendell Falls. Hmm. TORC’s own Trails page simply embeds a map from MTBProject showing area trails. Is that an ‘information gap jump’? I usually pass by gap jumps on the trail, but surely I could find a way over this one. A few segments of trail in Wendell Falls appeared to be visible in the Google maps satellite view. I was pretty confident something was out there and I’d be able to find it on the ground. I loaded my bike and some optimism in the car and headed to Wendell Falls. My first stop was at The Farmhouse. That’s the community coffee shop and gathering place. The line for coffee and barista trail advice was longer than my patience, so I just checked out the bulletin boards and flyers. Nothing helpful there. Back outside I saw a lady getting her dog out of her car to go for a walk. She should know something about the biking and hiking trails. Nope. She had not heard of the trails. Ok. I wasn’t out of options yet. I used up part of my optimism in telling myself that. Driving slowly through the neighborhood should turn up something – a sign, a trail leading into the woods, something helpful. About two blocks away I spotted a nice sign near an intersection. One of the items listed said, “Trailheads”. Ah ha! I made the turn and drove on. The road continued but I soon passed from the developed neighborhood into a section where they were just starting to work on the lots. No more signs were to be found. There were no trailheads or trails in sight. I turned around at the far edge of the construction work. I had been looking along the edge of the road but nothing resembling a trail leading into the trees was to be found. Do you see the trail entrance? If I was missing these trails with a drive-by, maybe I just needed to get on the bike and ride around the neighborhood. I was about to pull over when I noticed a guy biking down the road towards me. Surely he knows where the trails are. I stopped the car and waited for him to pull alongside. I explained I was looking for the bike trails and asked if he could point me to a trailhead. He started to tell me how to get there but then just offered to bike with me. Perfect! I parked the car along the street and got on my bike. I even remembered to start my GPS tracking before we headed off. My trail ambassador’s name was Jason. He was on his way home after biking with his son to the neighborhood school. How cool is the kid who gets to ride a mountain bike trail to school?! Jason and his family recently moved here from Colorado. I suspected I might be in trouble when he shared that tidbit. I knew for sure after he said he liked to ride fast. I just hoped he’d wait for me at intersections! Right off the bat, Jason hopped over a curb and crossed a sidewalk. He then rode down a grassy slope towards the treeline. The grass showed no sign that hikers or bikers had been crossing it. I would never have spotted this trail entrance by myself. At the bottom of the slope, a dirt path began at the edge of the bushes and disappeared around a tree a few feet later. Once we entered the woods I could see the well-defined trail. Jason’s back tire was disappearing ahead. My guided tour continued much like that. We popped out of the trees here, crossed a paved road or the dam of a retention pond there, and slipped into a nondescript gap in the trees on the other side. At times we rode down a street for a block, or used a sidewalk, to get to the start of another section of trail. Other times we rode through trail-less grass along a retention pond dam. The tread never showed much sign of bike use, but it was obvious someone had put time and effort into cutting these trails in. There were decent wooden bridges in place over most small creeks or drainages, but no trail blazes or signs. At one point we popped out of a trail into an active construction site. We waited for the bulldozer to pass by before turning around in the freshly turned dirt and heading back into the trail. After turning into the fifth or sixth separate section of trail, I realized we had previously ridden this one in the other direction. Not long after that, we emerged from the woods within sight of my car. We’d ridden about five and a half miles altogether. I’m sure Jason could have run through it all two or three more times, but I was dripping with sweat and already having trouble remembering every trail and turn I’d just seen. I thanked Jason again for the tour and he headed off to enjoy the rest of his day off. As I was about to get in the car and drive away, another cyclist rode by and stopped to chat. If I had just arrived, he too would have been happy to lead me on a tour around the trails. Back online, I emailed the Wendell Falls community office and asked if they had a better map of the trails. Two people responded promptly with a link to another page on their site with an interactive community map showing some trails. The map was somewhat stylized but gave me a better idea of where the trails were supposed to be located. A little google searching turned up a blog post by Avid Trails. They had been contracted to design and build about three miles of trail at Wendell Falls in March 2017. Their post mentioned TORC started the trail building efforts with a half-mile loop to show what was possible. Avid also returned in early 2018 to build another mile and a half of trail. I reached out to Avid Trails for more information. 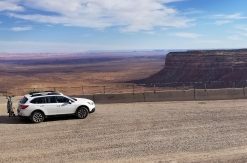 Justin, president of the company, responded and said they had recently provided the Wendell Falls folks with an updated GPS file of the trails. I also emailed TORC to see if they could share any more details from the trail club perspective. Sarwat and David both responded and shared some of the challenges TORC has faced with generating volunteer interest at Wendell Falls and the struggle of developing trails in a still-developing neighborhood. From my own experience with volunteer trail-building, I know someone local to the trails is going to have to step up and push to keep things moving forward. Having met two helpful mountain bikers on my first visit there, I’m hopeful there is enough local interest that someone will step forward. After touching base with Cali and Elyse at the Wendell Falls office again and asking better questions, I was able to get their official trail names and a better mapping of the existing trails. Those pieces of information gave me enough to make it across the ‘information gap jump’! Using my own GPS tracks, the online maps, and the trail names, I was able to add the individual Wendell Falls trails to the MTBProject.com database. I also added a ‘Featured Ride’ – Wendell Falls Tour From The Farmhouse, that guides you through most of the trail in the system at this time. The embedded map below shows the latest info for Wendell Falls from MTB Project. I also created a map of Wendell Falls Trails on caltopo.com. The Google satellite layer gives you the best understanding of where these trails are in relation to the roads in the development, even though the satellite images may not be up-to-date. The neighborhood development work sometimes moves too fast for Google to keep up! I’m glad you enjoyed our ride together, I know I did. I always look forward to meeting new people through my mountain biking adventures. We would love to have more riders come out and take a spin. 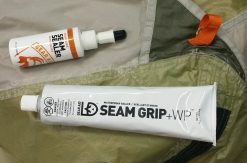 We have a Wendell Falls MTB page for those who are looking for another way to connect. That’s the Wendell Falls Mountain Bike Trails group on Facebook, right? I see there’s a workday scheduled for this Saturday. Perfect time to get more tires on the trails and polish off a few rough edges.